SCOTTSDALE, ARIZ. – Dec. 20. 2016 – Barrett-Jackson, The World’s Greatest Collector Car Auctions®, has lined up an incredible docket of rare, collectible customs and hot rods for the 46th Annual Barrett-Jackson Scottsdale Auction, to be held Jan. 14-22, 2017, at the WestWorld of Scottsdale in Arizona. 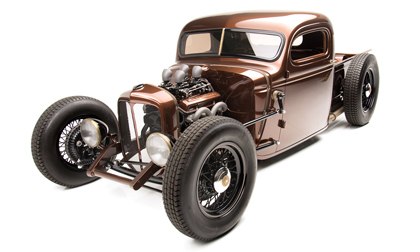 Among the featured customs to cross the auction block in Scottsdale is Boyd Coddington’s “Alumatub,” as well as “Brass Monkey,” a 1939 Chevrolet custom truck built by Eldred Hotrod Shop. The 1926 Ford Model T “Moonshiner” Custom (Lot #527) was built by hotrod legend Mickey Himsl in honor of his original “Moonshiner” that was highly popular in the 1960s. Finished in Skymist Blue, this custom hotrod took four years to build, was a featured display at the 50th Anniversary of the Grand National Roadster Show, and won 2015 Best in Class at the Grand National Roadster Show and Sacramento Autorama.